This card holder can be used to hold business cards, credit cards, ID card, coins, change, etc. It is designed for protecting your cards from losing or being broken. Made of fine quality PU leather, fine workmanship and stylish appearance. Made of fine quality PU leather, fine workmanship and stylish appearance. Multi-layer design, perfect for storing your business cards, credit cards, ID card, coins, change, etc. Protect your cards from losing or being broken, keep your personal information secure. Comes with a lanyard, so you can just hang it to your neck, easy to carry. 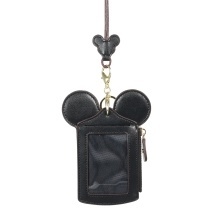 And it is equipped with a keyring for convenient hanging your keys. Cute cartoon design, perfect gift for girls and women. Due to the different monitors and light effects, the actual color of the product maybe slightly different from the picture color, thank you for your understanding.